I managed to grab GifCam 4.0 and GifCam 4.5 using Archive.Org but earlier versions were unrecoverable. The lack of hot keys is awkward. Saving to GIF is very slow. And yes, GifCam 5.0 is not portable. This now writes settings to the user\current\AppData\Roaming\GifCam folder. Spacebar controls the highlighted button when GifCam is in focus (if it's the Rec button, then you can start/stop recording). No global hotkeys yet. Does this application not have keyboard shortcuts? I don't see them. 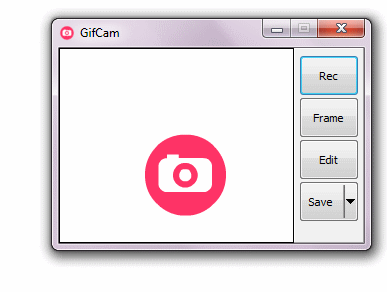 If you size gifcam to record a small area, gifcam's huge buttons are hidden when you resize gifcam and you no longer have any controls. I think the controls should be on a separate little window and not connected to the recording frame. Avast paid mode do not let me download this software. But I want to download. Please, help. Heck, who needs Camtasia?! This alongside Greenshot serves all your present and future screenshot needs.